If your accounting firm has more than one person who need access to client QuickBooks Online companies, the person who creates the QBOA account — called, in QBOA parlance, the master administrator — can set up the other users. The other users get their own login credentials and access to those clients that the master administrator specifies; for those clients, the user can access the Accountant tools. The master administrator also specifies the user’s level of access to the firm’s information; a user can have basic, full, or custom access. Using separate QBOA login information helps maintain security in QBOA, because a lot of financial information (product subscriptions and billing information, for example) is tied to login information. So, what’s the difference, status-wise, between basic, full, and custom access? Those users with full access can open and work in the firm’s books as well as in client QBO companies and can access the Team page and make changes to any user’s privileges. 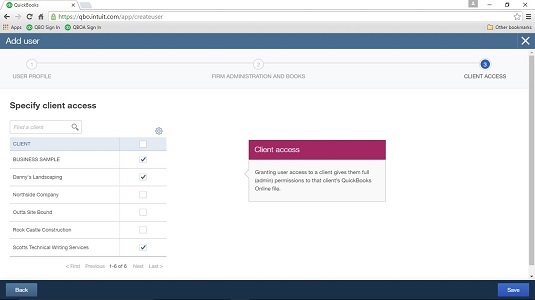 Those users with basic access can access only client QBO companies. Those users with custom access have nothing more than basic or full access with at least one privilege set differently from QBOA’s defaults for basic or full access. Click Team in the Navigation bar. The Add User wizard begins. On the first page of the Add User wizard, fill in the name, email address, and title of the team member you want to add. The team member’s title is optional. The second page of the Add User wizard appears. On this page, you identify the privileges related to your firm that you want to provide to the team member. Select the type of access you want to give to the team member. You can assign Basic, Full, or Custom access; a description of each type of access appears on the right side of the page. 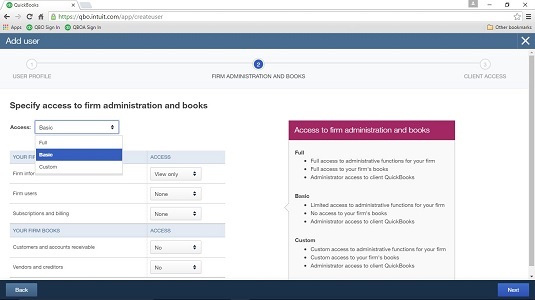 Assign Full access to those team members who should have access to your own company’s books. 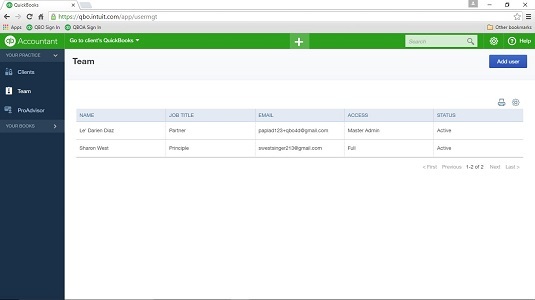 Assign Basic access to give a team member access to QBO client companies only. You can make changes to individual settings; if you do, QBOA sets the team member’s access to Custom by default. The last screen of the Add User wizard appears. On this page, you identify the clients for whom the team member should be able to perform work. QBOA adds the new user to your team and assigns a status of Invited to the user. In addition, the Status column on the Team screen indicates that QBOA sent an email invitation to the user, inviting the user to join your team. After the user responds to the QBOA invitation, the user’s status changes to Active on the Team page in QBOA. The email invitation that QBOA sends looks like this. 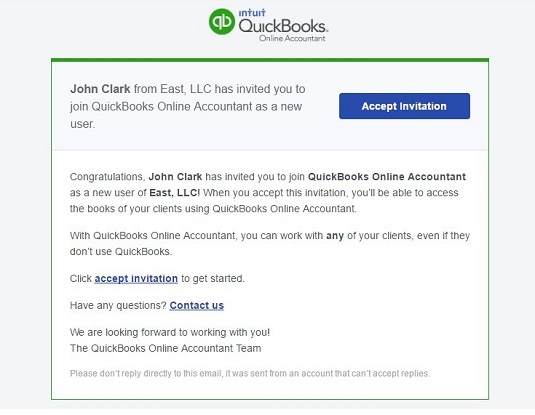 The recipient clicks the Accept Invitation button, and, assuming the invitee doesn’t already have login information for QBOA, the page below appears. On this page, the invitee sets up QBOA login information by providing a user ID (which does not need to be an email address) and a password. Once the invitee clicks Create User, QBOA confirms that the user ID is available, sets up the login information, and displays a page on which a Sign In button appears. Clicking the Sign In button signs the user into QBOA with the user’s assigned privileges. 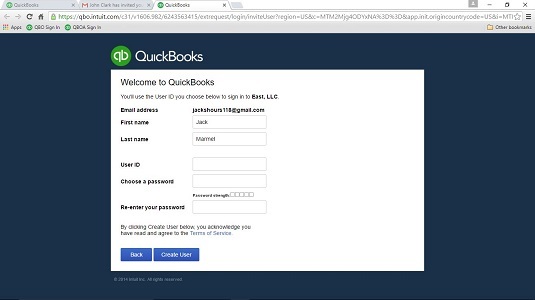 To log into QBOA in the future, the team member navigates to qbo.intuit.com and supplies her login credentials.